Try to be all things to all people, and what you generally wind up with is a program like Forte's new Agent version 3--a dauntingly difficult-to-learn and overly complex newsgroup reader. It's a shame, really, because underneath the hard-to-fathom metaphors, poorly chosen terminology, and illogically grouped options is the most powerful newsreader on the planet. Forte's Agent 3 is a powerful newsreader that suffers from an illogical organization scheme. I've been using Agent since version 1, and its ability to seamlessly stitch together multipart binary Usenet messages (newsgroup messages that have files attached) is second to none. Earlier versions had similar flaws, but they weren't as fouled up organizationally. With the added power in version 3 comes added complexity that makes the app more difficult to use. 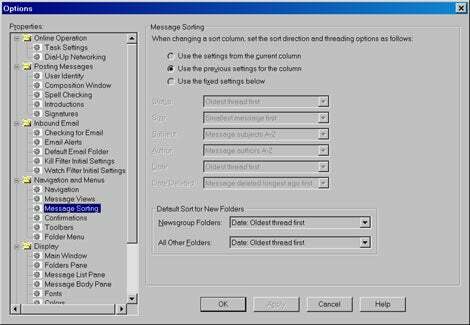 Agent also places no limits on the number of messages that can be retrieved, unlike other programs such as Outlook Express. This new version is even more powerful, allowing access to multiple news servers from a single interface; previously you had to have one installation of the program for each news server. Under Forte's complex organizational scheme, batches of newsgroups are "desks" and the newsgroups within are "folders." Alas, the method Forte uses to organize newsgroups in the new version is going to throw previous and new users alike for a loop. Instead of arranging groups by newsgroup provider and category as it should have, Forte decided to call batches of newsgroups "desks" and the groups placed in these desks "folders." Just to confuse things a bit more, there are also general-purpose folders, mail folders, outboxes, etc. I might have learned to live with the clumsy organizational scheme if Forte had gotten closer to putting relevant options where they should be. Instead, routine tasks like launching, saving, or deleting an attachment have been moved to a submenu, which doubles the time necessary to navigate to them. Routine tasks like launching, saving, or deleting an attachment have been moved to a submenu, doubling the time needed to find these options. 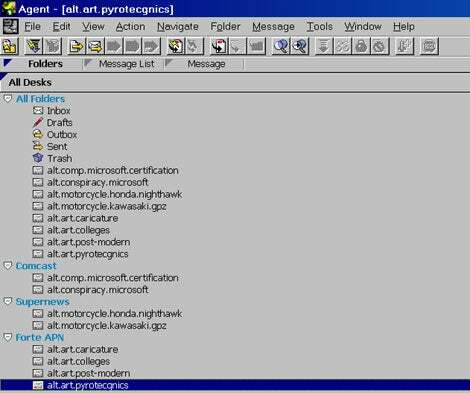 I could go on, but suffice it to say the program and interface are simply too complex and poorly organized for what is really a pretty simple task--reading and retrieving Usenet messages. However, Forte did one thing right in the organization of version 3: You can finally right-click on a "folder" to retrieve new headers, such as the subject, author, and date of a news message. Formerly, this function was accessible only from the main menu. Coinciding with the new version of Agent is the launch of the company's own newsgroup service, Agent Premium Newsgroups. After the frustration of Agent 3, APN was a breath of fresh air. Retention (how long messages stay available) is excellent--two weeks in even heavily used binary groups and nearly a year in text-only groups. Also, there's no censorship, incomplete binary messages are rare, and download speed was excellent in San Francisco, where I tested the service. APN is the best deal I'm aware of: 20GB of downloads for $10 monthly or unlimited downloads for almost $15. Rivals Supernews and Giganews are $10 a month for 10GB and $13 a month for 25GB, respectively, with only Giganews offering an unlimited plan for $25 monthly. Personally, I'm on the fence with Agent 3. I may simply ditch it and go back to version 1.92 while hoping that the company figures it out for version 4. For new users, at $30 it's a pretty good deal--if you have the patience to figure out how to use it. On the other hand, APN is a no-brainer; I'll be switching to it for my newsgroup service when my contract with Supernews is up in a month or so. This latest version is a powerful but overly complex and hard-to-learn Usenet reader. Forte offers an excellent newsgroup service, and the best deal going.